Every day we stand witness to the fallout from the ongoing struggle between preservation and progress: Books vs. Nooks, photographs vs. Photoshop, oaks vs. edifices – just to name a few. But it’s not just that historical buildings are being leveled faster than ... Too late. Sometimes, actually most times, the things inside the building matter just as much. Tree trunks no longer double as joists in basements or crawl spaces. And where are you going to find solid maple doors, leaded glass and brass fixtures anymore? The walls are different, too. Many buildings, like the McHenry County Historical Society’s headquarters, the former Union High School built in 1870, boast horsehair plaster over lath. Unfortunately, we have not uncovered any WPA murals – like the 66 restored at Chicago’s Lane Tech High School. They are considered to be a public art jewel, drawing more than 500 visitors each year on student-led tours. We certainly don’t have anything remotely approaching that archive around here … at least not yet. But when the federal government launched the Works Progress Administration’s art project in 1935, did it envision that the thousands of paintings and murals created would command such attention today? That is why a little-known artistic treasure in McHenry should give us pause. 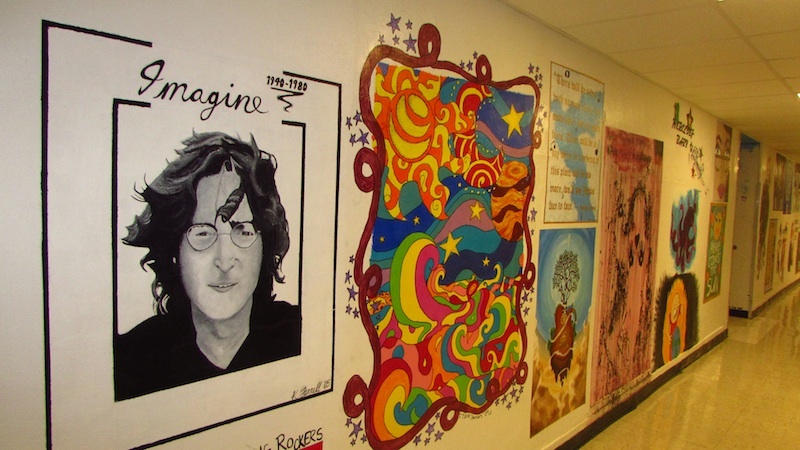 McHenry East High School’s first floor is chocked full of murals; about 100 or so, as a matter of fact. The program, which began nearly 20 years ago, was the brainchild of retired, 33-year art teacher Kevin Klopfenstein. Plus, Klopfenstein said, the prospect of creating a permanent mural provided him with important leverage. But now those murals are threatened. McHenry East Principal Eric Blake has proposed painting over the murals as part of a building restoration and spruce-up. And many students are angry about it, suggesting that the need for repairs is nothing more than a cover story to rid the halls of the colorful collage. Blake believes it is less about history and more about creating a professional academic environment. The son of an art teacher and a self-described arts supporter, Blake said it is not his intent to whitewash all of the murals. Blake said the community has made it clear that it expects District 156 to continue using its East Campus building, which dates to 1927. But that will necessitate upgrades to heating, air conditioning, plumbing and lockers – not to mention repairs to the plaster walls. Blake said he is willing to “back off” once the walls are “squared away structurally.” But that most certainly will mean many of the murals will be sacrificed and the vast majority of any new murals moving forward will have a short shelf life. “I propose starting with a clean slate,” he said. 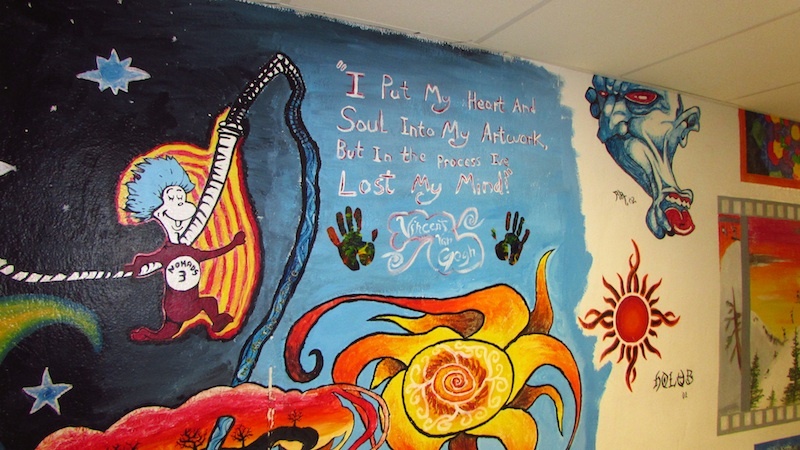 Jennifer Lopez, 17, confessed students “don’t feel comfortable doing a mural any more.” Part of mural program’s allure was its sense of permanence. Painting something at the end of the school year that might be up for only a couple weeks pales by comparison. Blake suggested taking pictures of the murals and running those digital images on a monitor mounted inside the high-traffic rear foyer. Exceptional pieces, such as portraits of Albert Einstein and John Lennon, should be preserved for future generations. But Klopfenstein said the idea that any mural would be painted over was unfathomable. All mural ideas are sketch first and vetted by the administration, said Advance Placement Art instructor Barbara Drufke. Most are about 18 inches square, painted using oils or acrylics.